“Secretary of defense Donald Rumsfeld, whose heart beats with the compassion of a crocodile, clings to his job by staging Florence Nightingale-like tableaux of hand-holding of the wounded while declaiming into the desert wind about ‘vicotory. '” — Sidney Blumenthal, Dec. 2004. Now, if Professor Marc Herold, who has with much labor counted the deaths of civilians in Afghanistan, is anywhere near right, American bombs and soldiers have killed 3,000 to 4,000 or so civilians. I did some numbers and decided that if Mr. Rumsfeld, who tells us frequently that he is a man of his word, does, as he says, mourn every civilian death, he must be a very busy mourner. I’m not sure how long it takes to mourn an Afghan civilian, but if Mr. Rumsfeld devotes only five minutes of mourning to each and there are, say, 3000 dead, he has had to mourn for some 250 hours. In other words, if he is able to devote eight hours a day to mourning, he has had to mourn for an entire month, including weekends and holidays. It makes you wonder how he has time to keep the bombs flying. I have several explanations for this. First, he may not feel it necessary to devote a full five minutes to a citizen of Afghanistan. Clearly, American citizens require considerably more than 5 minutes of mourning, but in Afghanistan life is cheap. Could be that just a part of a minute each is enough. Another explanation is that since so many of the dead are women and children, he may be able to mourn less for them than he would have to for a man. An Afghan baby, one would think, could perhaps be mourned for in just a few seconds. Or, here’s another view. If, say, he mourns them in groups, like when whole villages or several members of the same family are killed by the same bomb, he could save much time. He did not, after all, say that he mourns for them individually, just that he mourns for them. 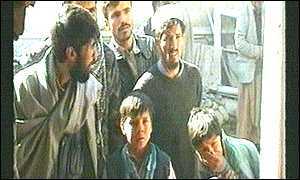 The picture is of a scene in which several family members, including a newly married couple, were killed by a bomb that hit their home. But it presents yet another problem. In this unfortunate blast, a boy of seven was blinded. Does Mr. Rumsfeld mourn only for the dead, or does he devote at least a minute or so to the boy who will go through life without eyes? Having to mourn for the wounded as well as the dead would, of course, add considerably to his grieving duties. The most likely scenario to explain the prodigious amount of mourning accomplished by Mr. Rumsfeld, though, is to be found in a closer reading of his statement. Note that he says “we mourn.” Perhaps it is not an editorial “we.” Perhaps he literally means that he has help in mourning. Let’s say, for example, if he delegates some mourning to Paul Wolfowitz, Mike Myers, Tommy Franks, et al, they could probably, all grieving together, knock out the day’s mourning fairly early in the day and still have plenty of time to plan more assaults. I don’t know how Mr. Rumsfeld manages it, but they say he is a remarkable man.